Amy took 6th in the IAAF World Championship 10,000 meters last summer and has a 31:13 PR. She will be running the 3,000 meters at Indoor Nationals this weekend! I find it interesting that she includes regular biking- "Even when I am healthy, I add stationary biking to my weekly routine to continue to stay healthy. yoderbegley.com I'm almost surprised more of the top runners don't use the bike as a regular cross training workout. The Kids Marathon lets school children run a marathon, safely, one kilometre at a time. It provides incentive, motivation, goal setting, rewards for achievment and promotes a healthy and active lifestyle among children. Schools in Connecticut have adopted the Kids Marathon Program "as a means of combating obesity, fostering more physical activity and better nutrition among children. " Statewide fitness initiative gets students off and running. Check out the list of running greats from New Zealand and Australia that are promoting this program! Follow the Tokyo Marathon This Weekend! Coverge starts 6 pm on Sat EST. Ed Whitlock- First Under 3 Hours After 70! Good article in Running Times featuring 78 year old Ed Whitlock, the first to break 3 hours in a marathon after reaching 70 years of age. Whitlock went on to run 2:54 at age 73! Should You Drink Extra Fluid 24 Hours Before a Marathon? The first published finding regarded runners' sodium levels, which Mohseni said were found to be lower after the race in slower runners, who take longer to finish. That means slower runners have more time to drink more water along the route, where volunteers are giving water out at every mile, Mohseni said. Michael Mohseni is a Mayo Clinic emergency room physician involved in the Runner's Science program. MY COMMENT: Neither finding here is surprising, although very few marathoners, even at an elite level, are aware that chugging extra water for 24 hours prior to a race apparently has little or no effect on their race day performance (unless of course they are dehydrated to begin with). Humans are not camels! Sherry Mahoney, Mayo Clinic Director of Nutrition, recommends about 4 swallows (or ounces) of liquid every 20 minutes. MY COMMENT: I've always enjoyed high intensity uphill cycling as a cross training workout once or twice a week. Goucher, at one time considered America's greatest distance running talent, is now 35 years old and healthy with sights set on an Olympic marathon berth in 2012. I can't wait to see him get into some races and mix it up with the younger group of American runners. It's a bit of a stretch to think he'll make the US marathon team (I don't believe Goucher has ever run a marathon), but he does possess a ton of talent so don't count him out. I'd like to see his strength training routine! Last week I got in my new E-Motion Rollers from Inside Ride. Needless to say, there is a learning curve for riding rollers, and while I haven't "danced" on the pedals yet like the guy in this video, I am slowing getting the hang of it (it took me about 10 minutes before I got the nerve to remove my hand from the wall!). My heel continues to show improvement, and all of my running is basically now pain free (although I can still feel something there walking around during the day after sitting). I switched back over to Powerstep Inserts- I think overall they offer more protection than Heel Seats, (I will use those when I start doing easy strides). For now I am jogging an average of 40-45 minutes in the morning, swimming 1000 meters or so after work (that's when I get my anaerobic work), then I hop on the rollers for 20 minutes when I get home. After that I take Sumo, who has been waiting patiently, out for another 20 minute mile jog. "Mini" workouts. I'll continue this progression and see how my foot responds to a gradual increase in distace before I set a long term goal. 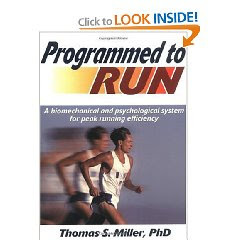 As for assignments and grading, students must design a fuel plan detailing what they will eat and drink, along with a mental plan that explains the "techniques and tools they'll use to get through the tough parts of the marathon." They will take a few quizzes and also be graded on attendance, but 40 percent of the grade rests on completing the Eau Claire Marathon in Wisconsin on May 2. MY COMMENT: Chris Lundstrum (a 2:17 marathoner) is heading up this class at the U of Minnesota. While this is not the first marathon training program for college credit, this is the first time I've seen this much detail and data collection. I agree with Chris- I find it interesting that 2-mile time is a better predictor than weekly mileage of marathon performance. Do you enjoy mountain biking to cross train from running? Watch this very intense 7 minute downhill ride. My question is did they ride up the mountain or take a lift? It goes without saying that some women are at a distinct disadvantage when it comes to running. I was recently having a disucssing about fitness with a couple of ladies when the topic of sports bras just happened to come up. As a result, I've added a new Women's Apparel category to my Running and Fitness Store. As a sidenote, you can also check out KALYX Technologies . I was watching ABCs Shark Tank when owner and former pro golfer Kimberly Cayce made a pitch for her company. While she didn't get the Sharks to bite (they did not believe she could compete on a level with companies such as Nike), she did get a chance to expose her product line to millions of viewers. Check out the Harvard evidence-based resource on Barefoot Running. MY COMMENT: Conversion to a forefoot striker is not as easier as taking your shoes off, and is not for everybody. Note Vibrum, maker of the Five Finger Shoes, provided funding. Good move by the company! Heel Seats use a product called KRATON to apply pressure on the heel. I am only doing slow jogging and am concerned about possible slippage at faster speeds, but other than that, they are comfortable. A few days later I received a pair of Powerstep Inserts, and gave those a try. 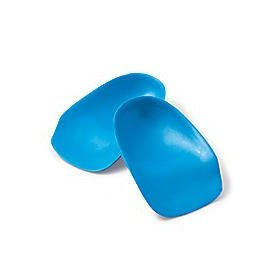 They are a good for pronation and support, and probably have also been helpful. In a nutshell, I've been using both, and my heel pain, while not 100% cleared up (I still have some pain after prolonged sitting, especially after a morning run) appears to be improving. For now, I am leaning towards sticking with Heel Seats. “that the perfect weight is the weight you are the day you P.B. in your event,” referring to the time you achieve your personal best — or fastest — finish. Good NY Times article about balancing training, performance, and weight. Lighter is better, but only to a point. Fleming is a former 2:12 marathoner who won at New York twice and was a top ten finisher at Boston 6 times. MY COMMENT: Good interview with Greg McMillan- unlike Ritzenhein, not afraid or revealing his runners "secrets." His comment agrees with what I've been saying all along about Ryan Hall's lack of racing at shorter distances. It remains to be seen if Hall can pop another good marathon without showing any improvement in his track times. Read Greg's 2009 recap - the future is looking bright in Flagstaff. Chocolate Milk Beats Endurox and Gatorade! MY COMMENT: Subjects did better on a performance test (70% max effort to exhausion) 4 hours after an exhaustive, glycogen depletion ride. They were given the drinks at 0 and 2 hours following the depletion ride. According to marsrefuel.com, 100 ml (3.4 oz) of Mars Refuel contains 77 calories, 3.1 grams of protein, 13.5 grams of carbohydrate, and 1.5 grams of fat. Chug the entire 300 ml bottle following an exhaustive workot and you get 231 calories, 9.3 grams of protein, 40.5 grams of carbohydrate, and 4.5 grams of fat. Back in 2006, researchers also found that subjects were able to perform better 4 hours later using chocolate milk as a post exercise recovery drink (Chocolate Milk as a Post-Exercise Recovery Aid). Nike runner and former Badger from Stevens Point, WI opened up his 2010 season with an impressive 3:55.75 mile at the oversized indoor U. of Washington track. According to Chris, with the exception of 2 track workouts, all he's been doing is "base" distance work. I recall back in my college days developing a huge distance base going into my last year preparing for the N.A.I.A marathon. Indoors, I managed to pick off 5th place in the 2- mile running 9:25 (very fast for me! )on nothing but distance work (OK I jumped in for a few 800s once a week but that was following a morning run and another 6-8 miles before practice). One of our outdoor meets was Conference Relays, including a 4 x 1 mile, and somebody talked me into running a mile at UW- Eau Claire. I guess we must have been short-handed, because I was slow and never competed in such a short race in college. In what felt like a painful all out sprint I ran 4:30 to make the 4 man team, only to tie up and run a disappointing 4:35 relay leg when it counted. Trust me when I say I was slow, but somehow I ran half way respectable off nothing but strength distance work. Not near Solinsky's level, but I know it doesn't take much speed to run a decent short race off huge volume and tempo. It will be interesting to see how he does this season- no secret Chris is on a mission to break 13 min for 5K, and he's off to a great start.